What if I Don’t Know What Caused My Social Anxiety? 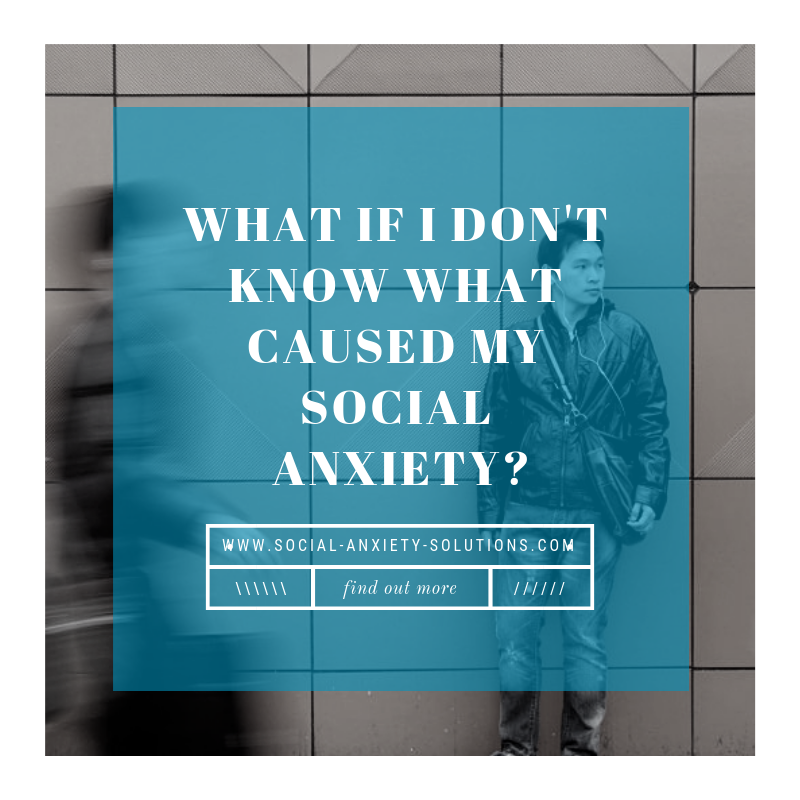 Do you worry that you’ll never know what to do about your social anxiety because you don’t know what caused it? Or maybe you feel there is way to much to work through to do it? 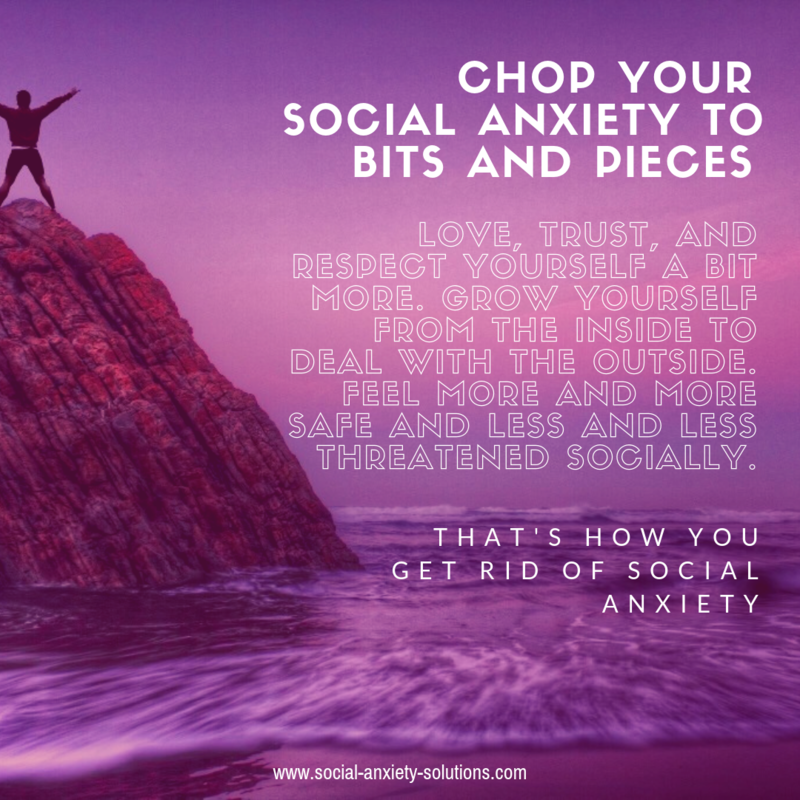 I’m sharing two tips to address these concerns and break them down so you can immediately start taking action to overcome your social anxiety! 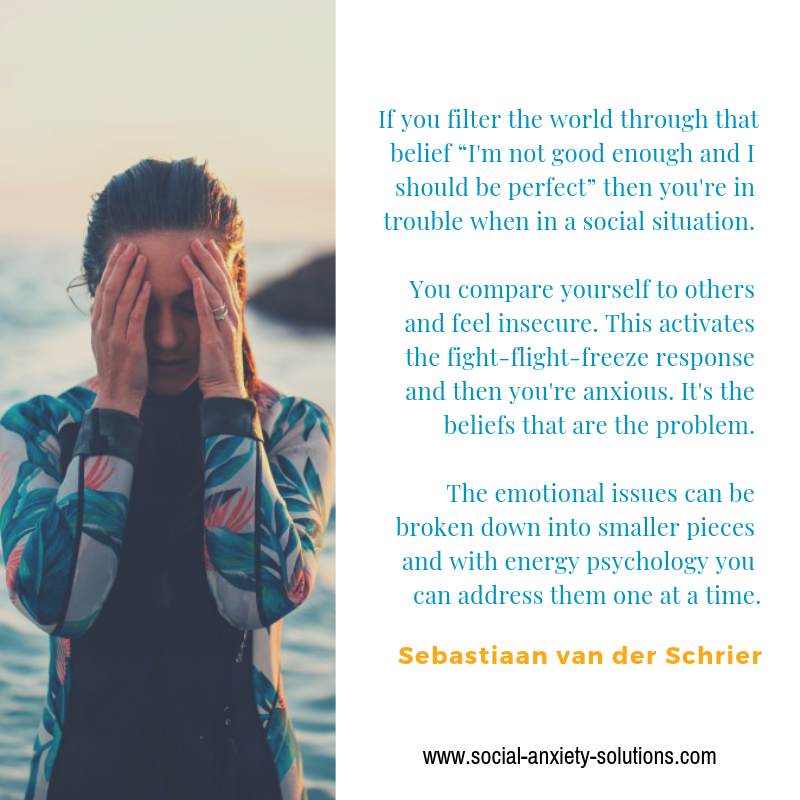 Sebastiaan: Hello, my name is Sebastiaan van der Schrier and I’m a former social anxiety disorder sufferer and a social confidence coach. I’m the host of a podcast called Social Anxiety Solutions where I interview psychologists, coaches, healers, psychotherapists, researchers etc. for the best social anxiety solutions. I am the creator of the social confidence system in the first-ever online social confidence community. My answer – When you’re seeing this first off, I talk a lot in my other videos about how your social anxiety is the result of your brain perceiving threat. Your brain is perceiving threats. As a result of perceiving threat, it activates this part of your brain called the amygdala. It’s actually a bit more complicated if we would go into the neurology but I’ll spare you the details. Basically, the amygdala is an almond-shaped sized part of the brain which puts your whole system in survival mode when there is a perception of threat. That’s actually what social anxiety is. You’re experiencing the result of the activation of the fight flight freeze response and your whole body’s in survival mode so your heart is racing, and blood is going away from your head and your digestive system into your outer limbs so you can run as fast as you can away from the danger. So you can fight danger as hard as you can if you need to fight it or you freeze, and you play dead if you can do either. That perception of threat is the real problem. Now you can manage the social anxiety symptoms by talking to yourself in a particular way – “Hey, it’s just a false alarm that’s going off and I’m alright”. You can kind of soothe yourself a little bit by using your language and it’s good to do that, it’s helpful to do that but you don’t really get rid of the problem until you actually address the perception of threat, what is causing the perception of threat. That’s actually beliefs. Beliefs like “They’re out to get me. People don’t like me. I’m not good enough. They’re better than me. I have to be perfect etc.” I could go on for a while. Now it’s these beliefs that you’ve learned from somewhere. You didn’t come into the world having these kinds of beliefs it’s a result of your programming. Well, the things that happen to you repetitively over and over and over and over and over and over and over when you were young because that’s where these beliefs are mostly formed. I’m talking about first twelve years of your life and especially the first six. That’s alright but patterns don’t change that much. You can have a rough idea of what was difficult or challenging in your early life and the patterns from that are pretty obvious. For example, if your parents are very critical and nothing you do is all right and you got criticized and blamed and that kind of stuff you just grow up making a conclusion conscious or unconscious that you’re not good enough or there’s something wrong with you. Well, that’s then a belief that is emotionally hooked to your nervous system through which you filter the world. If you filter to the world through that belief “I’m not good enough and I should be perfect” for example, well, then you’re in trouble when you’re in a social situation because you compare yourself to others, you don’t measure up, you are insecure as a result of that, that activates fight flight freeze response and now you feel anxious. It’s these beliefs that are the problem or part of the problem at least because it gets a bit more complicated to resolve the whole thing. However, it definitely can be done. The complex can be broken down into smaller pieces and luckily with energy psychology you can address these emotional issues one at a time. Chop your social anxiety to bits and pieces and take away one little part and another little part and another little part and have a bit more freedom, have a bit more ease, have a bit more comfort, accept yourself a bit more, feel a bit better about yourself, like yourself a bit more, love yourself a bit more, trust yourself a bit more, respect yourself a bit more and grow yourself from the inside. Be more okay with you so that you can deal with the outside world a lot better, so you start to feel more and more safe and less and less threatened by social situations. That’s how you get rid of your social anxiety. Now that is not exactly what this guy was asking me about but what he was asking me about said, “Well, what is the experience that I need to address or what are the experiences that I need to address?” Because he his words were literally, “I have thousands of them”. Well, I can’t exactly answer that, but I can give you some quick tips. There’s likely something that kick-started your social anxiety. Now this doesn’t happen for everyone. For some people they’ve been anxious for as long as they can remember. It started all the way early in childhood and it just gradually got worse when they hit puberty, or they went to a different school or they got bullied for a while or whatever. For them it’s more gradual. For other people there was actually something that kicked it off that might be a specific bullying experience, that might be the time when they had to read out loud in class and they stutter in the way and they were made fun of or the time that they froze up in front of their crush or the time when they got beat up or the time when they got bullied or the time when they moved to a different school and they left their friends behind and now they’re in this new environment and they feel all anxious and they don’t know how to deal with it or whatever. There can be a specific experience that kick-starts the social anxiety. Now if that is there for you that’s a very valuable experience to address with energy psychology EFT tapping, wide variety of other techniques but tapping will do. If that isn’t there, then we’re talking about the repetitive negative experiences from your early childhood that have already caused you to feel socially anxious. Now I already mentioned critical parents, that’s pretty common, overprotective mom or dad or your family, your parents with high expectations, anxious mom or dad, alcoholic parents, abuse etc. There’s also a wide variety of that I can keep going for a long time but all the things that could go on. But it’s basically the things that happened over time over and over and over that are similar that made you feel bad about yourself or that made you feel unsafe or not safe to be you. These experiences and that indeed can be a whole bunch of them, these experiences that you need to be addressed because these are the most foundational core limiting beliefs about yourself others in the world have been formed. Those are your imprints and so that needs to be addressed. How to do that? That’s beyond the scope of this video. That’s where you want to go. Now, for example, you can pick a specific memory from that or a few specific memories from that and address them one by one. Definitely not the most effective way of going about it but an effective way of going about it. That is the generalization effect. There’s something called the generalization effect in EFT tapping world and that is that yes, you might have a thousand uncomfortable painful, hurtful past memories but you don’t have to address all of them in order to get relief. 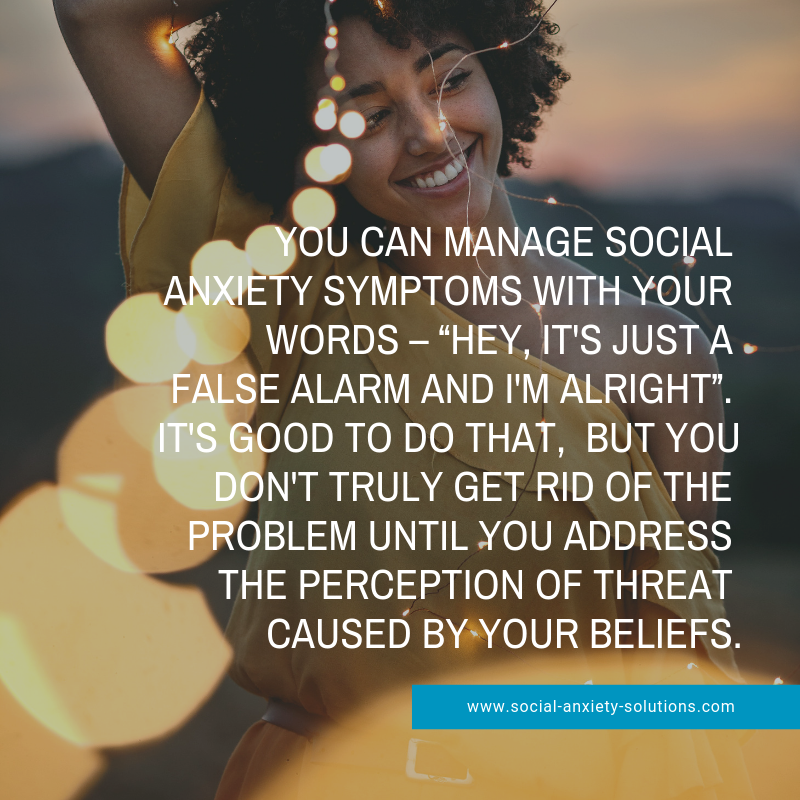 You don’t have to address all of them in order to resolve your social anxiety, you just need to address the right once. Well, which ones are the right ones? That’s different for different people and I can tell you which yours are but there are ways of finding these. When you find the right ones you only need to address a couple of the key ones and then the whole stuff will collapse. I’ll give you one example. For example, when someone has social anxiety there’s usually something that they fear happening the most. For example, you might fear the most becoming embarrassed and then people seeing you become embarrassed. That might be your worst-case scenario. Well, how would you feel if a situation like that would happen? You might say, “Well, if that would happen, I would become embarrassed and others would notice it. I would feel humiliated”. Okay, so, that’s the feeling that you’re really trying to avoid, that feeling of humiliation. Because you’ve experienced in the past and it was so bad that you don’t want to feel that ever again. You then might find that you have a whole bunch of experiences where you were humiliated. Maybe they always mocked you in class, maybe people look down on you, maybe you asked your crush out and she laughed in your face or maybe the teacher humiliated you in front of the class, maybe your mom always said something in a particular way to you etc. You might have a whole bunch of memories of humiliation. Maybe if you can write a list down you can come up with this long list and you might think, “Oh, man, I have to address every single memory. It’s going to take such a long time”. And not really because of the generalization effect. Now, you might have several commonalities within each of these memories. Maybe it’s a lot of similar people, maybe it’s a lot of similar environments, maybe the circumstances are very similar, maybe the way how you react is very similar. Anyway, your subconscious is aware of how these memories are related and when you address a couple of the key memories, three, maybe five, maybe more but usually in my experience if you address three or five of them that whole feeling of humiliation drops. For example, you might have a hundred memories of humiliation, but you address five of them, so you clear, you neutralize the emotion of five of them and all the other 95 release as well and you get a big profound shift. That’s the answer. I hope it’s been helpful. This is the tip of the week. This is Sebastiaan from Social Anxiety Solution. I hope this has been helpful. If this was helpful subscribe here, like it, share it, do whatever you want. Have a good day and I will talk to you next Thursday with another installment of the weekly videos. Alright, bye for now.